Watch as Komodo CAN Duo interface is used to simultaneously interact, monitor, and transmit data to the CAN/I2C Activity Board using the Komodo GUI Software. This video shows the new real-time, USB class-level decoding feature in the Data Center Software for the Beagle USB 480 Protocol Analyzer. Holiday Promotion Ends Dec. 25! The end of the year, always brings a little chaos – deadlines at work, increased crowds and family obligations. 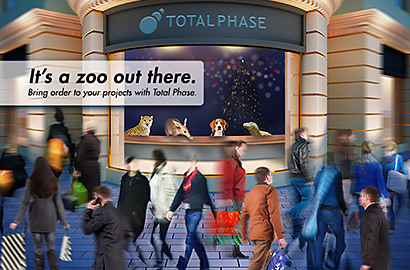 Allow Total Phase to help simplify your work life by bringing order to your projects; our USB, I2C, SPI, and CAN tools will help you get through the end of year debugging push. Save big and debug now with our Holiday Promotion! The Promira Serial Platform was released last month and there has been a lot of excitement about its capabilities such as integrated level shifting (0.9 – 3.3V) and Ethernet and USB ports. In addition, the Promira platform offers performance advantages through its enhanced I2C and SPI programming speeds. Using the latest version of the Flash Center Software makes programming memory especially easy and takes advantage of the Promira platform’s faster speeds. Explore the Promira Serial Platform today and experience what it can do for you. Congratulations to Lee H. from Singapore for completing our I2C/SPI survey in June and being the lucky recipient of a Promira Serial Platform! Thank you for a great 2014; we look forward to your partnership in the coming year. Wishing you a wonderful holiday and prosperous New Year! The Beagle USB 12 analyzer was very useful, allowing me to succeed in debugging problems arising from differences in how Windows and Linux handle USB device descriptors and access devices.